If you're like me, you're hesitant to let your kids help cook. Meal prep takes longer as your kids help measure ingredients or wash fresh fruit, and messes are bigger when little hands pour milk or stir soup. I also get discouraged when I make a healthy meal my girls won't eat. Recently, I came across an article that talked about how kids are more likely to try new foods and eat healthier options if they help cook. Cooking also builds a child's confidence and improves family bonding. It's time for me to get my girls in the kitchen more often, and these five websites offer great recipes, ideas, and tips for fun and success. I'm lucky because we don't have food allergies, but my older daughter's best friend does. We found the website Super Healthy Kids one day as we searched for a nut-free snack the girls could make together during a play date. This active website is now one of my favorite sources of recipes because it allows me to search for appetizers, gluten-free recipes, or no-cook dishes. I confess that I don't always plan ahead, so I use the SHK website often to find dinner ideas and holiday meals, too. My kids told me last month that they were tired of eating sandwiches every day for lunch, so I challenged them to research new ideas. They found Weelicious, and it's been a lifesaver! My girls now make all kinds of foods for their lunches. Personally, I like the website because of its search function. I can put in an ingredient, like eggplant, and find recipes to make with it. My grocery bill has fallen significantly because I no longer waste food! I also save time because I can search by the type of food I want to make, how long I have to cook, or any food allergies I need to avoid. A friend served us Annabel Karmel's Chicken and Apple Balls last week, and they're finger-licking good! That's when I knew I needed to learn more about the British children's chef and cookbook author's website. On it, I find food and nutrition ideas for babies, toddlers, kids, and parents. I appreciate the healthy recipes with step-by-step instructions and tips for how the whole family can get involved in meal prep. These features mean even my inexperienced young helpers get to make delicious foods. Despite my love for play, my girls and I sometimes like to veg on the sofa and eat chips. Hey Kids, Let's Cook! promotes healthy eating habits and has given us dozens of ideas for nutritious snacks. We've also learned fun tips about how to cook. For example, my girls and I now use a melonballer to make fruit salad, and we appreciated the behind-the-scenes look at a bakery. As a parent, I also appreciate that this website reinforces math, literacy, science, and other school subjects, and it's so engaging that my girls now ask to watch the videos and then make me dinner! My girls are visual learners, and they adore the Cooking With My Kid website. It features tons of pictures and offers step-by-step instructions that are easy for my girls to follow. I also appreciate the dozens of nutritious meals and fun snack ideas, including Broccoli and Spinach Pie, Pasta Salad Skewers, and Cornbread Donuts made with non-fat yogurt! There's even a section for babysitters, which means I can trust that my kids will eat healthy even when I'm not home. Cooking with kids can be challenging, but there are so many benefits! 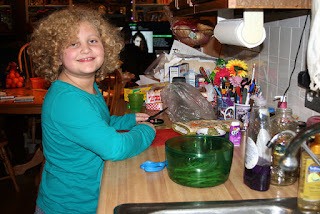 I hope these five websites give you and your kids much enjoyment in the kitchen together. I know my girls and I appreciate the healthy, kid-friendly recipes. Bon appétit!